Abdul Ahad (b. 1968) is a renowned astronomer/sci-fi writer. He was born and raised up to the age of nine in a tranquil village in the Balaganj Upazila of Sylhet, Bangladesh. Thereafter he moved across to the United Kingdom with his parents and two sisters to take up residence in Luton, Bedfordshire. He is author of the First Ark to Alpha Centauri series of novels, published 2005 onwards in Baltimore, Maryland, USA. 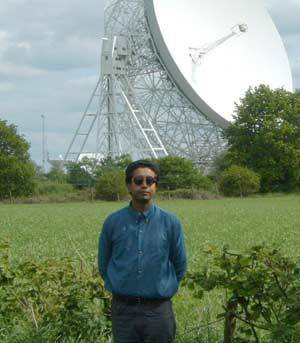 Amongst his astronomical discoveries, Ahad is noted for defining the eponymous “Ahad’s Sphere” theorem of the Sun. He also identified the semi-regular supergiant star 119 Tauri (CE Tauri) to be the second reddest naked eye star in the whole night sky. Upon first noticing the true gem-like colour intensity of this star one evening in April 2004, he coined it the “Ruby Star”. That particular year, Autumn had arrived in even more spectacular fashion than before across the miniature world’s curving interior. By the third week of October, the avenue of silver birches that ran along the entire length of Inertia Drive had turned an intense shade of yellow. The trees dazzled in the crisp, conical rays of sunshine that poured down from miniature suns suspended high above. Their small leaves fluttered in the fresh autumn breeze that blew in off the marsh-like banks of Eridanus, which flowed at the other end of the street. A soft and soothing rustle whispered through the trees that punctuated the late afternoon stillness which had settled over the quiet suburban retreat. Haroon Fiorello drove up the road in his metallic-purple sports rover and pulled into the drive way of number seventy five. He parked underneath the Douglas fir that towered up majestically from the home’s front yard. It was the end of another week of grinding problem-solving at work, and he had a refreshingly ‘Friday feeling’ about him. This Friday was something even more special, and to spice up the occasion he’d spent the whole afternoon trawling the various malls of central Utopia looking for a couple of items of extravagance that would give a sparkle of surprise to his sweetheart. He yanked open the rover’s trunk door, grabbed his bulky shopping bag and walked towards the house. Once inside he called out, “Hi honey, I’m home,” angling his voice up towards the first floor bedroom. He set the bag down onto a small tea table in one end of the living room. Rush rush rush, that’s all we ever seem to do these days, Caroline thought as she slowly made her way down the flight of stairs. She’d almost finished getting ready, both her hands still trying to fit an earring onto the left lobe of her ear. He stared at her in sheer admiration for a second, and couldn’t recall the last time she’d looked half as breathtaking. She was simply dressed in a flowery summer dress and a blue ribbon that loosely tied her blonde hair back. At twenty six, to Haroon, she appeared a true ‘Centauri Princess’… no… the Centauri Princess, as in his eyes few other women out there even came close to filling that prestigious title. He helped her with her earring, standing closely behind. The scent of her hair drove his mind to somewhere between fantasy and ecstasy… maybe closer towards ecstasy, he decided. She turned around and probed wonderingly into his clear brown eyes. He took her in his arms, paused and then they kissed. He looked into her topaz-blue eyes. “You said the roads would be clear, remember?” he said softly. She didn’t reply to that, and went over to the black shopping bag that had caught her attention. She pulled out a six-pack of champagne of a brand similar to Moet et Chandon, and a boxed-up jewellery gift. She held up the small blue box and looked at him, biting one side of her lower lip with a smile. “Open it then,” Haroon said. She did. And discovered it was an expensive diamond necklace, studded with an abundance of rubies and emeralds. Caroline’s face brightened even more than the sparkle thrown out by the gems in the necklace. She looked at him, standing handsome and tall. His black hair and tanned face made him look too irresistible. She called to him with her forefinger. He wandered over, and they resumed where they’d left off.